What is the impact of this framework on learning and teaching with Mobile Web 2.0 tools? In what ways is the framework able to help the teachers with the design and facilitation of the course? Does the TPACK 2.0 construct exist? If it does, what shape does it take. Does it enable learner-generated context and what impact does it have on the learners learning experience? The project involves 4 staff teaching a cohort of 80 students. There will be four streams in this course each with 20 students. Students are expected to work in pairs but each accountable for their own work. Students in the project will be provided with iPads for use for the semester. Each pair will receive an iPad 1 and an iPad 2. Students in an hour long session will be taken through creating a Google account, which will give them access to various Web 2.0 tools such as Blogger, Google+, Picasa and YouTube, the core Web 2.0 tools for use in this project. 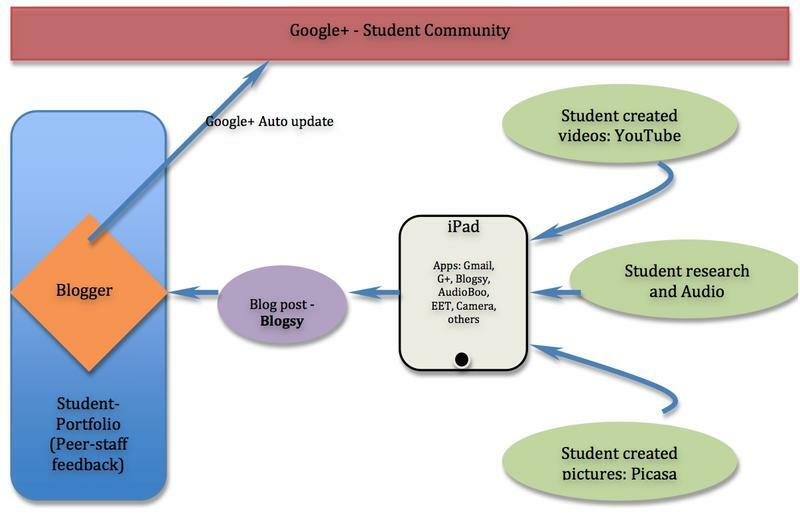 The concept map below outlines how these tools will be used in the course by students and teachers. The researcher will provide weekly pedagogical and technological support to teachers and technological support to the students for the duration of the course. The secondary role for the researcher in this project is data collection. A pre-project survey will be administrated to elicit students use of technology and learning experience and a post-project survey will elicit data from the students on what their experience had been. A focus group with students at the end of the semester will also elicit data from students on their learning experience. Data from student blogs will also be collected throughout the project, these will be reflective blog posts from the students on their learning/task. Reflective data from the weekly meetings with staff and students will be collected as part of this action research. An end of the project focus group will also be held with the teaching staff. Blogsy – Using Blogsy make a blog post – Introducing ? The student introduces him/herself.